Persian General Mardonius saw an opportunity to crush the Greeks in July 479 BC near Thebes. Persian King Xerxes I “The Great” was a man who liked to solicit different opinions before he made a decision on any important matter. He was in the midst of a campaign to conquer mainland Greece in the fall of 480 bc, but his fleet had been savagely mauled in September at Salamis. It was a stunning defeat, made even more distasteful because Xerxes had personally witnessed it while sitting on a golden throne. in and respectfully waited for the conference to begin. The king wore a tall, jewel-studded headdress, a symbol of his status, but Xerxes did not need the trappings of royalty to assert his authority. Mardonius was one of the first to speak. He was Xerxes’ cousin, but military talent, not nepotism, made him a general in the king’s host. If we are to believe the Greek historian Herodotus, Mardonius was one of the chief promoters of this campaign, urging Xerxes to deal with the troublesome Greeks once and for all. The Greek settlements in Ionia along the eastern shores of the Mediterranean were already controlled by Xerxes, but they were a rebellious lot. They were encouraged by the Greek city-states on the mainland, particularly Athens. Mardonius argued Athens must be punished, and the conquest of Greece would remove a thorn from Xerxes’ side. The Ionian Greeks would have nowhere to turn if they wanted to revolt again. Xerxes invaded Greece with an army of 200,000 men. At first, the Persian avalanche was successful, and as the mighty host proceeded Greek cities in the north were quick to offer earth and water in token of submission. But other Greeks were made of sterner stuff. Led by King Leonidas and his Spartans, an Allied Greek army heroically held the pass at Thermopylae. When the Persians learned of a way through the mountains, the main Greek army was forced to withdraw to avoid encirclement. Leonidas and a handful of Greeks stayed behind and fought to the last man in August. population to evacuate to Salamis Island. The Persian king took his revenge in a spectacular fashion, burning the city and destroying the temples on the Acropolis. It looked as if he was on the cusp of total victory. As Thermopylae was being fought, the allied Greek fleet met the Persians at Artemisium. The Greek triremes held their own and achieved some local success, but the sheer weight of the Persian fleet began to tell. The Greek fleet withdrew to the south. The naval battle at Salamis tipped the scales in favor of the Greeks. The Persian fleet lost about 200 triremes, and many more were damaged in the fight. Even more important, the Greeks had gained a psychological, as well as a physical, victory over their opponents. The Persian fleet comprised ships from many different subject peoples. The fleet lacked a unity of purpose, and no doubt most of the ship crews were serving under duress. Fear of the king’s wrath was their chief motivation. Despite the unexpected defeat, the Persian fleet still vastly outnumbered the Greek fleet, but surviving crews were badly shaken. Morale was low, and few wanted to renew the contest. Ships could be repaired, but what little enthusiasm the king’s sailors had for the campaign died with their comrades in the deep blue waters of Salamis, which was filled with debris, broken oars, blood, and corpses. The Greek victory at Salamis, while significant, was not as decisive as it seemed. In some respects the triumph was more apparent than real. Xerxes was the master of northern and central Greece, and his army was large, intact, and undefeated. Only the Peloponnese, the homeland of the Spartans, was as yet unoccupied and still defied the Persian king. From the Persian point of view, Salamis might be only a temporary setback. That is why Mardonius urged his cousin to press on with the campaign. The Peloponnese was in effect a giant peninsula, connected to the mainland by a narrow neck of land at the Isthmus of Corinth. That neck had been blocked by a hastily erected wall, but there was still enough of a Persian fleet, demoralized or not, to contain the Greek triremes. If the Greek ships could be held at bay, a mole or bridge of some kind might be constructed, in much same way as the Hellespont had been crossed earlier in the campaign. Once the isthmus was outflanked, Xerxes’ army would march in and the Peloponnese would fall. That, at least, was the heady scenario that Mardonius was confidently predicting. After some further debate, Xerxes dismissed all his officers and officials and sent for the one person he had grown to rely on above all others. That individual was Queen Artemisia of Caria. She was that rarity in the ancient world, a woman whose courage and brains were valued over her beauty or desirability. Artemisia held her own in a male-dominated world, and she was respected for it. Herodotus was awed by her because she actually commanded the Carian naval contingent. Artemisia was far from a good general; for example, at Salamis she actually rammed and sank a friendly trireme in an effort to escape pursuing Greeks. But on land she was much more valuable, contributing a keen intelligence to the Persian cause. Although Mardonius favored attacking the Peloponnese, he also suggested an alternative: Xerxes might go home with the bulk of the army while he would stay on with a substantial force. Winter was fast approaching and with it the end of the campaigning season. Mardonius would winter in Greece and resume the offensive in the spring. Artemisia arrived, and Xerxes laid out the two courses of action being considered. He asked her which she favored. The queen pondered the alternatives. She advised the latter course: Mardonius would stay in Greece and in the spring would complete the conquest. If the campaign was successful, it would be to Xerxes’ credit, Artemisia said. But if Mardonius was defeated “it would be of no great loss, because you and the affairs of your house will survive,” she said. 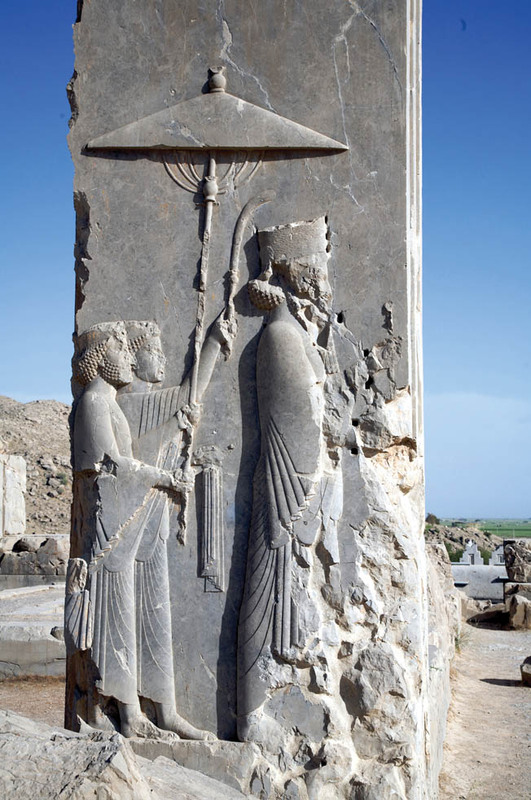 Persian King Xerxes I with attendants. He sent his army deep into Greece, determined to crush it once and for all. Xerxes was pleased and decided to take her counsel. He was too far from the Persian capital of Persepolis from which he could monitor his vast kingdom. He wanted to return to Persia. Only time would tell whether Ahura Maza, the Zoroastrian deity of the Persians, would prevail over Zeus, the god of the Greeks. If Mardonius wanted to accept responsibility for the campaign, let him. He could be a convenient scapegoat if things turned out badly. The king’s massive army began a withdrawal from Attica, continuing on through Phocis, Boeotia, and Thessaly. Once in Thessaly the army divided, with Xerxes taking some troops with him back home and the remainder staying with Mardonius. Ancient figures are almost always misleading, but the king’s cousin probably had upward of 100,000 troops with him. Just before Xerxes went home he met with a Spartan herald, who formally demanded compensation for the death of King Leonidas at Thermopylae. Xerxes laughed and pointed to his cousin. “This is Mardonius, and he will pay the Spartans the compensation they are owed!” said Xerxes. After Salamis the Greeks fully expected to fight another sea battle the very next day. They were happy to have won a victory against the odds, thanks to hard fighting and the metis of the Athenian leader Themistocles. Metis was a concept of the mind that used cunning, invention, and intelligence to achieve its ends. Themistocles, wily and resourceful, had sent a secret message to Xerxes saying that many ships in the Greek fleet were about to desert. Enraged at this betrayal, Themistocles said the Athenians were ready to switch sides and join the forces of the Persian king. But he also added that if the Persian fleet entered the Straits of Salamis, they could cut off the retreat of the other Greek triremes. It was all a ruse, of course, a trick to lure the Persian fleet into narrow waters where their numerical advantage would be neutralized. The Persian king was no match for Themistocles and his Athenian metis. Yet after the battle the Persian fleet’s Egyptian contingent was largely intact, a nucleus that, with the survivors of Salamis, could still outnumber the Greeks. Luckily, the psychological damage inflicted on the Persian fleet was even greater than the material damage. It would play little or no part in the next campaign. The battered Persian fleet withdrew to the island of Samos, mainly to keep an eye on Xerxes’ troublesome Greek subjects in Ionia. While it was clear the Persian fleet would not stage a major offensive, its mere presence was a thorn in the Greek side. With winter approaching Mardonius’ army bivouacked in Thessaly to await the coming of spring. The ships in the Greek fleet dispersed to their home ports, and the Spartans and other units from the Peloponnesus withdrew to their defensive line at the narrow neck of the Isthmus of Corinth. The spoils of Salamis were distributed, and the Greeks made dedications to their gods and erected commemorative monuments and memorials to their heroic dead. The Athenians returned to their devastated city, which had been heavily damaged in places. But homes and temples could be rebuilt, of course, and the Athenians were pleased that they were free of the Persian yoke. While they were rebuilding, the Athenians stumbled upon Xerxes’ golden footstool atop the hill where he had watched with anger and dismay as his navy was defeated at Salamis. This was a special prize, and it was dutifully carried up to the scorched Acropolis and dedicated to the city’s patron goddess, Athena. The ruined city once more pulsed with life, and the Athenians celebrated their deliverance from the Persian yoke with song and dance. One of the dances was led by a talented teenager named Sophocles, who eventually would become one of Greece’s most talented playwrights. Chilling autumn winds lashed Attica, heralds of the rains that soaked the earth and watered the crops. Naturally quarrelsome and stubbornly independent, the Greeks had a hard time keeping their alliance strong and intact. Part of the problem was centered on geography. The Spartans wanted to essentially abandon central Greece, which included Athens. The Spartans and other Greeks lost no time in building a wall across the isthmus. The Athenians wanted to confront the Persian host as far north as possible but they were going to need a lot of luck and employ a large dose of metis to get their way. Curiously, the Persian general Mardonius actually helped the Athenians in this regard. Mardonius may not have been as cunning as Themistocles, but he knew the Greek alliance was shaky. Perhaps Persian gold in the form of bribes would accomplish more than Persian spears ever could. Above all, the Persian general realized that Athens and Sparta were the pillars of the Greek alliance. The Spartans were considered dull and unimaginative, stupid in everything except the art of war, but if luck and Ahura-Mazda favored them, the Athenians might rise to the bait. The Persian general began his verbal offensive in the spring of 479 by sending Alexander, King of Macedon, as a special emissary to the Athenians. If the Athenians switched sides, Xerxes would offer them freedom, probably a form of autonomy, within the Persian Empire. To sweeten the deal, there would be new lands in the offing, and the Athenian temples, mostly in ruins, would be rebuilt with Persian gold. No doubt angered and disappointed by their response, Mardonius moved south on Athens. Once again, as after Thermopylae, the entire population was evacuated to the island of Salamis. This time the Persians spared nothing; they torched nearly every house, temple, and public building. Only a few houses were spared to temporarily house some Persian officers. The rest was laid waste. When the Spartans still hesitated to march north, the Athenians issued an ultimatum: Join us or we will accept the Persian offer. This was a message even the thick-headed soldiers of Sparta could understand. The Spartans and their Lacedaemonian perioikoi (affiliated communities) would come to the aid of the Athenians. Approximately 5,000 Spartan hoplites would be the core of this contribution. Each Spartan would be accompanied by several psiloi, servants, or attendants who doubled as light troops. When he heard the Spartans and other Greeks were coming, Mardonius decided to abandon Attica and withdraw to Boeotia. There were sound strategic reasons for this. Boeotia’s plain would give him ample room to maneuver, and it would be favorable to his cavalry. Persian cavalry was excellent; the Greeks had no cavalry to oppose them. If the Persians went to Boeotia they also could use Thebes as a base of supply. The Thebans already had sided with the Persians. The Spartans and the other Greek allies linked up with the Athenians at Eleusis. In the meantime, Mardonius entered Boeotia at Tanagra and eventually set up a fortified camp at the north bank of the Asopus River, not far from the town of Plataea at the foot of Mount Cithaeron. On the Greek side it was decided that Pausanias, a nephew of the heroic Leonidas of Thermopylae, would assume overall command of the allied Greek forces. Aristides and Xanthippus were co-commanders of Athenian forces. A rival of Themistocles, Aristides later worked with him. Xanthippus is famous for being the father of the great Athenian statesman Pericles. The allied Greek army crossed through the mountain passes but did not enter the plain; instead, it formed a defensive line facing north in the foothills of Mount Cithaeron. This placed it on higher ground ideal for defense against cavalry, and rocky spurs protected its flanks. It was the height of summer, and the heat at that time of year can be suffocating. Water was essential, especially for a hoplite who wore a heavy bronze helmet and bronze body armor. Initially, at least, the Greeks had access to the Gargaphia Spring. But they could not venture near the Asopus River because of Persian archers. The Greek left was anchored by the Spartans, Lacedaemonians, Tegeans, and Thespians, totaling 30,000 men. The center was held by another 30,000 men representing a score of Greek states, including the Corinth, Arcadia, Mycenae, and Styria. The left was where 20,000 Athenians, Plataeans, and Megarians took their places. As might be expected, the Persian army under Mardonius was much more polyglot, drawn from the four corners of their vast empire. The core of the army was 60,000 Medians and Persians. This included 1,000 Immortals, who formed Xerxes’ famous bodyguard. The Persians wore colorful tunics and trousers, which the Greeks felt were effeminate. They wore a flapped headdress or turban called a kurbasa, and very few wore armor. At best, a few might wear light scale armor, but most had no body protection at all. Their shields were made of wicker, which was a decided disadvantage when dealing with Greek swords and spears. Also with Mardonius were the Bactrians, people from the area between the Parmir Mountains and the Hindu Kush in the northeast regions of the Persian Empire. They made excellent cavalry. Indians were also present, inhabitants of what the Greeks considered the edge of the known world. The best cavalry, except for the Persians, was the Sacae, which history generally knows as the Scythians. These hard-riding nomads were experts with the Asiatic composite bow. Herodotus says the Egyptian marines were the best armed and armored of the non-Greek forces. They had a variety of weapons at their disposal, including naval pikes, axes, and large swords. They also wore plaited helmets and cuirasses. A Greek hoplite is shown locked in combat with a foe in a period sculpture. Hoplite tactics included othismos, which called for the front line to push the enemy back with their shields. And last, but certainly not least, were the medized Greeks, the Hellenes fighting on the Persian side. As might be expected, they were heavily armored warriors with arms and equipment similar to the allied Greeks on the opposing side. Because they would be fighting in phalanx fashion, they would be a formidable foe in battle. For several days there was a standoff. The Greeks were not about to be lured down into the plain, and Mardonius was not going to be foolish enough to attack a phalanx formation on high ground. Eager to break the impasse, Mardonius sent in his cavalry to attack the Greek left. There seemed to be a weak point in the Greek line in that area, where the Megarians were positioned. The 3,000 Megarian hoplites were posted near an area of flatter ground on a spur in the foothills of Mount Cithaeron, which was the geographical boundary between Boeotia and Attica. This made it somewhat easier for the Persian horsemen, who attacked in multiple waves. This was the highly mobile, hit-and-run tactic in which the Persians excelled. Swarms of Persians would gallop near the Megarian line and send showers of arrows into their ranks. After discharging a few missiles, the riders would retire, only to be replaced by yet another swarm of fresh cavalrymen. The Persians, some of whom apparently spoke Greek, added psychological warfare to their lethal wasp stings. The horsemen shouted that the Greeks were women, hoping to goad them into a rash advance. The Megarians stood their ground, but the constant missile attacks were wearing them down. Encouraged by the small victory over some of the Persians’ best men, the Greeks decided to advance to the northeast, closer to the river, though it was still some distance away. The ground was undulating and still favored the defense, though perhaps it was not as promising as their previous position. In any case, the two armies once again became inactive. For the next eight days, the opposing forces just looked at each other from a distance. Both Pausanius and Mardonius consulted the gods. Seers with each army sacrificed animals and examined the entrails for signs and portents. The gods seemed to favor a static, defensive posture. The divine message appeared to be the following: If either side crossed the Asopus River and attacked, there was a risk of catastrophic defeat. Mardonius probably hoped that he could starve the Greeks into submission. The area where the Greeks encamped had been stripped bare of resources by the Persians. Greek soldiers normally carried only a few days rations on campaign; after that they were expected to live off the land by plunder or purchase. As the days dragged on the Greek army became dependent on long supply trains through the mountains. Sanitation must have also been a problem. Many thousands of Greeks were more or less living in the same spot, and human waste was probably an issue after a few days. Torrid temperatures, flies, and excrement would bring a terrible stench and the threat of disease. By contrast, Mardonius’ supplies were dwindling, but he was better off than the Greeks. Mardonius decided to stage a bold raid behind the Greek lines. A large cavalry force slipped out under the cover of darkness and positioned itself near the entrance of the pass that cut through the mountains. The raiding party surprised a Greek supply column of 500 transports, probably pack animals and carts pulled by lumbering oxen. The Persians were in their element, freely using arrows, spears, and swords to finish off the supply train personnel, mainly slaves, servants, and attendants who were helpless noncombatants. The Persians slaughtered without mercy, even killing many of the oxen and pack animals. Some have interpreted this as not mere bloodlust, but a sign of their mounting frustration and sheer boredom of a campaign that seemed endless. The loss of the supply train was a serious blow to the Greek cause. Eventually more supplies could be brought up, but the process took time, and no doubt the Greeks felt the pinch in the short run. Curiously, Mardonius did nothing to follow up this successful raid. Perhaps he was hoping that hunger would further weaken the bonds that held the Greek alliance together. There was always the hope, albeit an increasingly forlorn one, that some of the Greeks would come over to the Persian side. Three days after the Persian raid, King Alexander of Macedon made a clandestine appearance under the cover of night. He warned the Greeks of an impending Persian attack but advised them to stand fast. This change of heart on the Macedonian’s part has never been fully explained. The allied Greeks prepared for a possible Persian thrust the very next day. Alexander’s intelligence proved correct. The Persian cavalry advanced, once again lobbing arrows and javelins into the Greek ranks. But this harassment was only the beginning of Greek troubles. Some of the Persian horsemen rode over to the Gargaphia Spring, fouled it, and immediately afterward blocked it up for good measure. Here was the real crisis of the campaign. The spring had been the only source of water for the whole Greek army, and there was almost no food left. The Greek leadership decided to fall back to a position in front of the town of Plataea. It had fresh water, and the Greeks could guard the mountain passes. The retreat was to be conducted at night so the Persians would not detect any movement. But the withdrawal plan fell apart, and the various Greek units became somewhat scattered. The Spartans were the last to move off, partly because of an argument between Pausanius and one of his Spartan subordinates, Amompharetus. Amompharetus thought that any withdrawal, regardless of how tactically sound it might be, was tantamount to cowardice. He refused to leave the original Spartan post, which put Pausanius in a difficult position. If he left Amompharetus and his division behind, chances were that they would be cut off by the Persians and annihilated. Pausanius also did not want to be accused of abandoning fellow Spartans. The two Spartans started yelling at each other, and the argument grew more heated. In the meantime, the Athenians were still on or near the original left flank. They were fully prepared to depart but were puzzled by Spartan inaction. The Athenians sent a horseman as a messenger to find out what was going on. When the Athenian courier arrived, the two Spartan commanders were still arguing. Pausanius did stop long enough to assure the Athenian messenger that the Spartans were indeed going to withdraw, appearances to the contrary. A smear of light appeared on the horizon, harbinger of what the Greeks called “rosy fingered dawn.” Originally the intention had been for the Greeks to retreat under the cloak of darkness, but now, thanks to the arguing commanders, the Spartans would have to march in daylight. Realizing he could delay no longer, Pausanius finally ordered the main Spartan body to march as planned. Amompharetus could not believe his eyes; he and his men really were being left behind. Pasanius and the main Spartan forces were about 10 stades, slightly more than a mile, from Amompharetus when he realized the danger and reluctantly ordered his men to catch up. Luck was with the Spartans because the very moment Amompharetus rejoined the main body, Persian cavalry appeared on the scene. The Spartans prepared for battle, their new position being “by the River Moloeis and in an area called Argiopium where a shrine of Eleusian Demeter stands,” according to Herodotus. The Spartans and the Lacedaemonians and Tegeans with them formed solid ranks, perhaps eight deep, and awaited the Persian onslaught. They probably had a substantial number of lightly armed men with them as well. But Pausanius recognized that he was going to be hard pressed, so he immediately sent a messenger to the Athenians to come to his aid in full force or “if something has happened to make this impossible, we would be much obliged if you would send us your archers,” wrote Herodotus. The Athenians were indeed on their way to support the Spartans when they were attacked by medizing Thebans. Herodotus is strangely laconic at this point, merely saying that the “Boeotians [Thebans] fought the Athenians a long time.” This would be a typical hoplite encounter, with opposing forces literally shield to shield. Each side would be armed with hoplite spears, about eight-feet long, with leaf-shaped heads that were made of iron or bronze. Over arm thrusts were effective, and underarm thrusts could strike at an enemy’s lower body and legs. When spears were broken, fresh weapons were brought up from the rear. The Greeks called this shoving tactic othismos. Opposing sides would mass together while fighting, a whole seething mass of densely packed humanity, thrusting, pushing, and shoving its way forward. 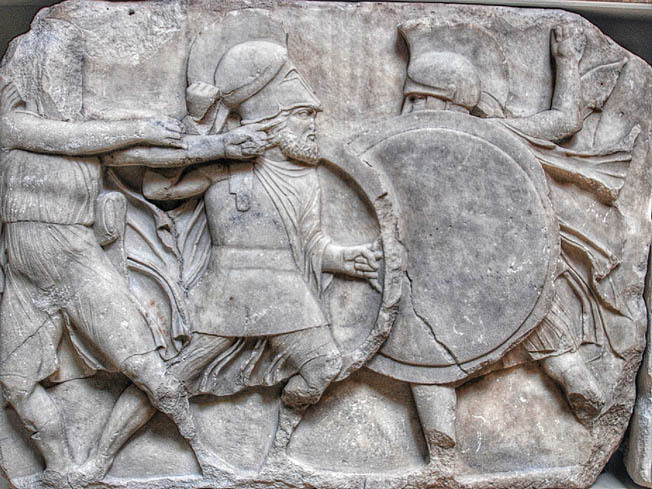 A hoplite battle was a nightmare for the individual Greek soldier. His bronze Corinthian helmet provided good protection, but his hearing was muffled, his vision was restricted, and above all ventilation was poor. In battle the world was transformed into a chaotic swirl of impressions that overwhelmed the senses and numbed the emotions. Screams of the wounded mixed with shrill war shouts, the thud of shield on shield, and the metallic clang of spear points and swords hammering bronze helmets and cuirasses. Finally, the Thebans broke and ran. Once a phalanx formation was disordered, its soldiers were highly vulnerable. The men of Athens had won a great local victory, but their triumph was somewhat eclipsed by the subsequent Spartan stand against the Persian main forces. Mardonius himself arrived on the scene accompanied by the Persian infantry. The Persians tried to soften the Spartans up by sending showers of arrows into their packed ranks. Their helmets and cuirasses afforded some protection, but so many hundreds of arrows rained down inevitably some lethal shafts hit exposed arms, legs, and necks. A lucky shot might even hit the face via the helmet’s narrow front opening. Pausanius offered animal sacrifices to the gods even as the battle raged. There was a temple of Hera in the vicinity, and Pausanius literally faced the distant building and offered a personal prayer. If must have done the trick because when fresh entrails were read the signs and portents were now favorable. Encouraged by this, the Spartans switched to the offensive. The Persians fought with skill and courage, but their short spears, relative lack of body armor, and wicker shields put them at a disadvantage. The tide began to turn in favor of the Greeks. Then, the Greeks really got lucky. A Spartan named Arimnestus saw Mardonius himself mounted on a magnificent charger. In a maneuver reminiscent of David and Goliath, Arimnestus seized a rock, took careful aim, and flung it with all his might. The rock hit Mardonius square in the head and killed him outright. The Persian army lost heart when its commander was killed. Whole formations began to break and run, many seeking safety in the fortified Persian camp across the river. The retreat became a rout; one of the Persian subordinate commanders, a man named Artabazus, fled with his division and took the road to Thessaly. His hope was to reach the Hellespont and home. The Greeks briefly laid siege to the Persian camp. The Persians fought with the courage of desperation, for they knew the Greeks would take few prisoners. For a time, the Persians repulsed the Greek assaults. But eventually the Greeks scaled the fort’s walls, and the slaughter commenced. Mardonius’ great army, once so powerful, was reduced to a few frightened remnants fleeing for their lives. The rest were, for the most part, dead. The Greeks had won a great victory and avoided subjugation under a foreign yoke. The golden age of Greece, with all its triumphs and tragedies, was about to begin. Tags Allies, Asia, Athens, axe, Bactrian, Cata, cavalry, CIA, Composite Bow, Dice, EAM, Egypt, general, Greece, Greek, greek sword, greek swords, Hoplites, india, javelin, Lae, Leonidas, Macedonia, Macedonian, Marines, Mediterranean, military, Monitor, Morat, Mycenae, navy, NSA, Odo, OSS, Pausanius, Pericles, Persia, Persian, phalanx, pike, POW, SAS, Sparta, Spartans, spear, sword, swords, Tern, Thebes, Themistocles, Thermopylae, Thor, Tory, trireme, Troy, US Army, waves, weapons, WIN, wounded, Xanthippus, Xerxes.